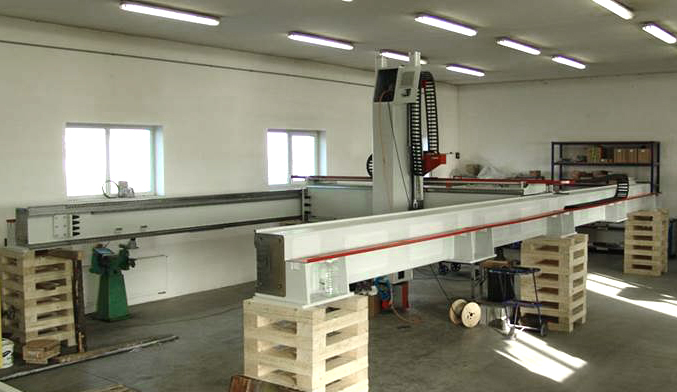 A manufacturer of processing machines was ordered to expand its built CNC machine with a driving axis of 5m length to the double length. The primary drive of the axis was made with a ball-screw drive. Due to the double length of the travel axis, a drive with a ball screw is no more possible. The manufacturer was looking for a suitable alternative of the drive, where the accuracy of the complete system has played a central role. In order to achieve appropriate accuracy over a length of 10m, ATLANTA designed a new drive with rack and pinion. The new drive consist of Q6 racks in size m=6 which have been mounted in line. For the mounting of racks to the correct pitch, ATLANTA Assembly Kid (patented) was used. The high precision drive was ensured by ATLANTA HT-Servo Worm Gear Box with a backlash of <1 arcmin and an ATLANTA pre-load pinion shaft. With the pre-load pinion it’s possible to reduce the backlash between the rack and the pinion subsequently to the running parameters of the machine. For a permanent lubrication of the drive there was used an ATLANTA electronically controlled lubrication unit with felt gear.